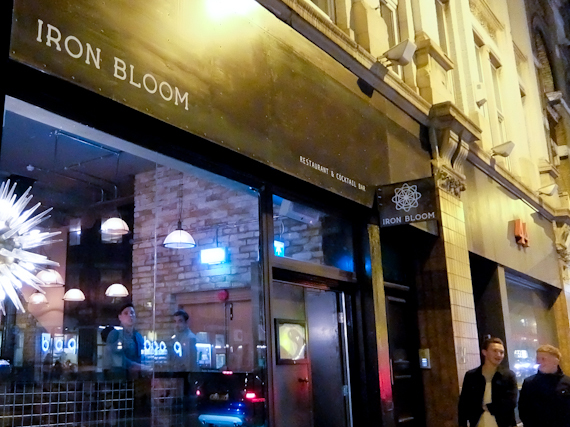 Wandering around a buzzing Shoreditch on a Friday night, it’s easy to miss Iron Bloom, thinking that it’s just of many identikit bars that are pumping out music. 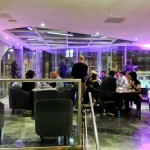 In fact, it’s a restaurant with a wide-ranging cocktail menu, as you’d expect from the guys behind the Looking Glass Cocktail Club, but the quality of the food is surprising. The premises used to be an iron foundry, hence the name of the restaurant, and inside is all industrial chic, exposed bricks and low key lighting. 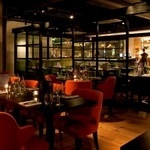 In the centre is a long communal table, perfect for sharing, but booths on the side cater for those who want privacy. 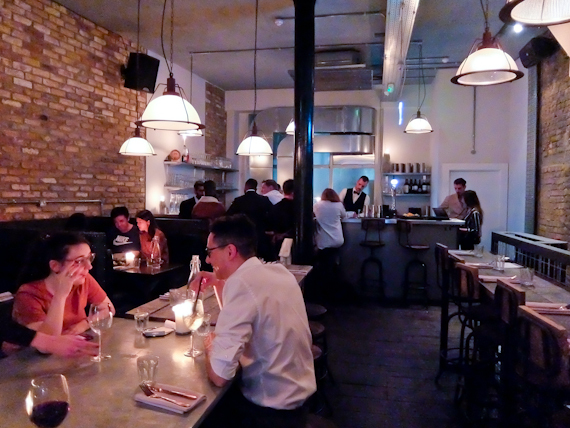 Service is warm and attentive and it has a good vibe. Even the former lift shaft has been turned into a suspended DJ booth. 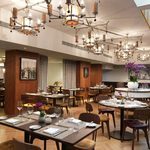 Food is described as “British Cuisine with small sharing plates” but although the ingredients are fresh from Borough Market, just across the river, the menu roams across the world. The idea is that you choose a couple of nibbles and then three or four sharing plates with optional sides like truffle and parmesan fries. The crispy fried pickles with a peppery mayonnaise are an easy nibble but the black pudding quail scotch egg is far more substantial and probably the most British dish on the menu. It’s also rather good. Not usually a fan of Spanish croquettes, we enjoy their wild boar version with apple, a substantial starter. Presentation is excellent and the sharing plates arrive like pictures on a page. 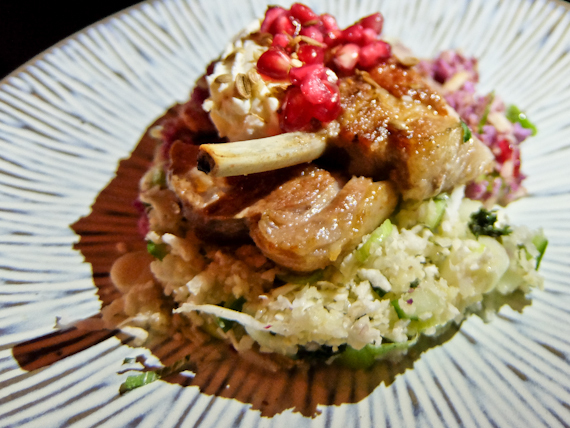 English lamb cutlets on a bed of tabbouleh with citrus curd are a winning combination. Smoked cod roe with crab butter on crumpets, topped with caviar, is probably an ingredient overkill, but the tuna tartare, with lime and samphire, wins by its simplicity and freshness. 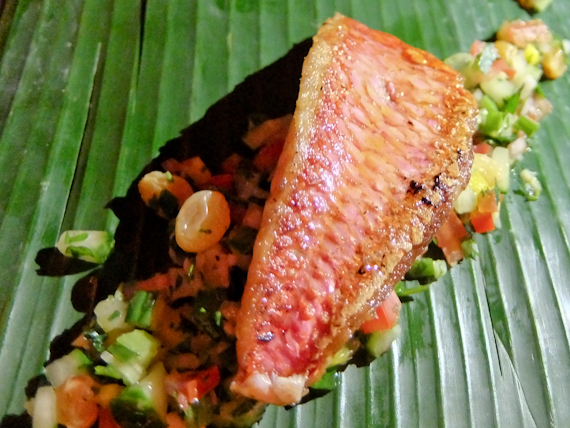 We also like their fillet of charcoal grilled red mullet, cooked with agave, rum, raisin and pineapple served on a banana leaf, light and tangy. Of course, we can’t leave without trying their Wagyu beef and bone marrow burger. It’s delightfully fat-free, sandwiched inside a brioche bun, stuffed with onions, bacon and cheese, and pretty impressive. Head Chef Dean Beaumont’s inventive take on British tapas certainly delivers flavours that reflect the quality of his ingredients. The plates are the correct size to share and it’s a delight to come away from dinner, feeling satisfied yet not stuffed. If we were younger we’d now have the energy to hit the party that is Shoreditch on a Friday night. Sadly we just about manage to wobble our way home on our bicycles. Nibbles range from £4.50 to £8. Sharing Plates range from £8 to £19.